Scotland will gain clear benefits from the new era in British politics, Scottish Secretary Danny Alexander said today as the new Coalition Agreement was launched. Mr Alexander said that it was vital to Scotland that the UK Government was making the deficit reduction programme their overriding priority. He said that Scotland would also benefit from a number of UK wide measures - such as tax cuts and restoring the earnings link for the basic state pension - that affect the lives of many people in Scotland. 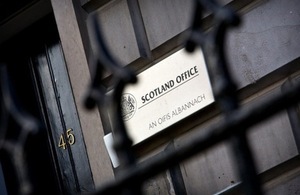 Scotland will also benefit from the significant political reforms outlined yesterday by the Deputy Prime Minister. This includes measures to make the House of Lords an elected chamber, allow the public to recall MPs in certain circumstances, fix the length of Parliamentary terms and to have a referendum on the voting system used at General Elections. “This is a new dawn for British politics and Scotland is already benefitting greatly from it. “The Prime Minister and Deputy Prime Minister have agreed the overriding priority of this Government is to reduce the deficit. This is as vital to Scotland as it is to the rest of the UK. The daily lives of many people in Scotland will also be improved by commitments in this Coalition Agreement to restore the earnings link for the basic state pension and to increase the personal allowance for income tax for those on lower and middle incomes. “Today’s announcement clearly underlines this coalition Government’s commitment to Scotland and our decision to review the control and use of revenue from the Fossil Fuel Levy in Scotland sends a clear signal of our intention to work constructively with the Scottish Government. “I am delighted the Chancellor has also agreed to look at ways of helping with fuel costs in remote and rural areas. There are many rural communities in Scotland where soaring fuel costs are crippling drivers and hauliers and I am sure this announcement will be warmly welcomed by them. “The establishment of a high speed rail network is something that would make travel by Scottish passengers faster and greener, bringing benefits to both our economy and our environment. The Scottish Secretary Danny Alexander, led the Liberal Democrats negotiating team which formed the coalition government and he has maintained the leading role in putting together this Coalition Agreement. The Coalition Agreement also contains a range of other matters that will extend to the whole of the UK.